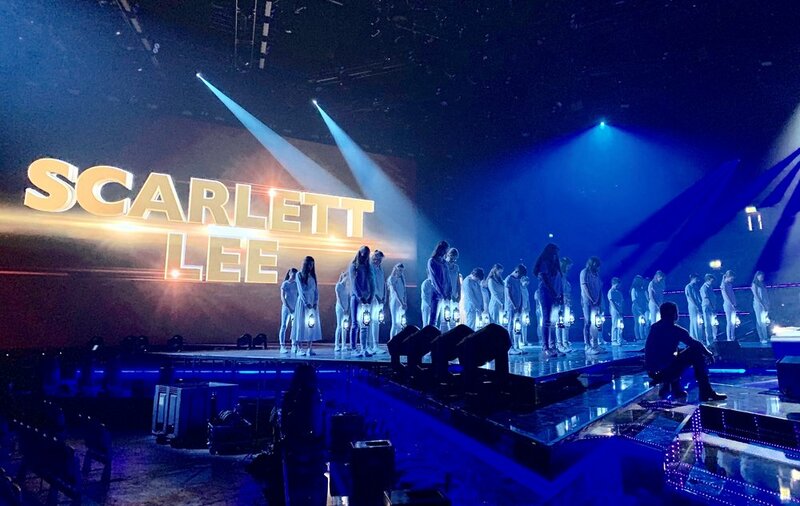 On 1st December 2018, Farnham Youth Choir took to the stage at one of the biggest live televised events of the year as part of the Live Final of ITV’s ‘The X Factor’ at Wembley Arena. Forty choir members sang alongside finalist Scarlett Lee as she performed Sir Elton John’s Your Song, also featured in this year’s John Lewis Christmas advert and popularised by Ewan McGregor in the Baz Luhrmann film, Moulin Rouge. With only 24 hours’ notice, FYC’s senior choir raced to join forces with Thames TV, recording a full studio version of the performance at Metropolis Studios, Chiswick. The following day, Saturday 1st December, the choir piled on to a coach for Wembley Arena, rehearsing during the day and singing in the live final at 7.30pm. Performing as part of the first hour-long series finale, FYC shared the billing with the contestants, series judge Robbie Williams, global superstar George Ezra, Emile Sande and former X Factor winner Leona Lewis. Despite the watchful gaze of the series judges and music business supremo Simon Cowell, the choir’s performance lit up the arena. For nearly 40 years Farnham Youth Choir have performed at the highest levels of choral excellence, singing at both The Vatican and Notre Dame in the past two years. FYC will be entering the Grand Prix of Nations & European Choir Games in Gothenburg in August 2019. The concert held on 8th July at Farnham Maltings had the usual celebratory feel, bringing all the choirs together on the stage and summing up what has been achieved during the past season. It is always lovely to see singers from age 6-18 performing with joy, directed by their various conductors and all ably accompanied by pianist Matthew Rickard. The concert opened with a set from the senior FYC choir, directed by Jo Tomlinson, who sang several sacred pieces from the sixteenth century up to the present day, including the dramatic piece To Agni with text taken from the Hindu Rig Veda. The final piece in this first set was a World Premiere of And then we knew Peace by Janet Wheeler, commissioned by FYC. Next to the stage came the crowd-pleasing Trainers Choir who despite their young ages performed wonderfully, with clear diction, good intonation and smiling faces! Conductor Sarah Burston has them well trained! After the interval we were treated to songs in English and in French from the Junior Girls Choir, conducted by Jo McNally, followed by songs performed jointly by the Girls and the Junior Boys Choir, directed by Patrick Barrett. Both these choirs had enjoyed the opportunity to perform together this year in a new work, Dies Irae, by Ian Assersohn at Dorking Halls. As a thank-you for their dedication, Ian composed a setting of the words Silver by Walter de la Mare, and this was given a World Premiere performance with the composer present in the audience at the Maltings. Patrick Barrett then directed the Boys Choir with songs in Congolese and Hebrew, followed by Panis Angelicus, ably assisted by the senior boys from FYC. Jo Tomlinson conducted a set of lighter pieces from FYC to close the concert, including the quirky and demanding piece Wah Bah Dah Doo Bee! by the Swiss jazz composer Ivo Antognini and a charmingly choreographed version of Paloma Faith’s Upside Down, arranged by Michael Higgins who was present in the audience. All choirs rose together to perform the final piece Goin’ Up a-Yonder which has been a favourite in the FYC repertoire for some time and brought tears to the eyes of the leavers! Now back on English terra firma, it’s time to reflect on what an amazing six days we have just spent in Paris and the Dordogne. In a busy but never frenetic programme put together with imagination and flair by current parent Sophie Budd, FYC had the opportunity to perform in four very different church acoustics, from the dramatic spaces of Notre-Dame in Paris to the small but perfectly-formed church of St Vaast in the Dordogne village of Villac. And with plenty of opportunities in between for sightseeing, ball games and making Easter chicks in a chocolate factory in nearby Terasson (which also happens to be Sophie’s home town), everyone came home tired but extremely happy. The choir consisted of 38 singers (35 girls, 3 boys) and the adult group comprised Sophie (as tour leader), together with Jo Tomlinson, Matthew Rickard, Sarah Burston, Alison Nicholls, Neil Ferris and Graham Noakes. After an early start, leaving Farnham at 6.00am, we had a straightforward journey in bright sunshine, catching an earlier ferry and reaching Paris in late afternoon. ‘Home’ for the first leg of the trip was the FIAP Jean Monet in the southern part of the city. A cross between a youth hostel and a hotel, the accommodation was ideally designed for young groups such as FYC, including a self-service canteen and a large meeting room (complete with piano) where we could rehearse and chill. After checking in and some much-needed fresh air and exercise in the nearby Parc Montsouris - with cakemaster Neil doubling as head of games - we returned for supper and then bed. With glorious sunshine showing off the iconic Parisian landmark to perfect advantage, this offered the ideal opportunity for group photoshoots. We climbed up to the Basilica to get the spectacular views across the city, but our initial plan to busk near the entrance met with the clear disapproval of an armed soldier - a common (and surprisingly comforting) sight during our stay in the capital - so discretion took over and we sang several flights of steps further down, much to the delight of the many tourists. After a brief walk through Montmartre, past the Moulin Rouge, we had an excellent lunch in a nearby restaurant and it was then off on a similarly traffic-free coach ride to the Eiffel Tour and boat trip on a Bateau Parisienne. The day finished back at the hostel with supper and traditional soirée of songs and comic turns by our highly-talented youngsters. But for the fact that two of our younger choir members unfortunately got stuck in the lift before supper, it would indeed have been just about the perfect day! The big day for all us! Despite a strike on the Metro (in competition with London Underground?) threatening further traffic problems, these did not materialise and we arrived early for our rehearsal. This gave us the chance to walk around inside Notre-Dame and take in the spectacular scale and grandeur of the cathedral. It was then down into the bowels of the church to change and warm up, before emerging for our 25-minute concert spanning five centuries of sacred music. However much Jo and the rest of us had been looking forward to this tour highpoint, nothing had truly prepared us for how special it was going to be. As in Périgueux and Sarlat later in the week, the vast acoustic would have starkly shown up any imperfections of tuning and ensemble, but FYC rose to occasion magnificently, filling the cathedral with its spine-tinglingly beautiful sound. To say Jo was happy with the choir’s performance would be a distinct understatement. Having repeatedly preached to the choir the importance of always staying together, especially in crowded places, I managed to get detached from the group as the choir went back to get changed and so had to join the visiting parents outside to wait for the choir to emerge. Not surprisingly, they found this highly amusing (and definitely Twitter-worthy!) but it did provide the opportunity to confirm how much they too had found this such a special and memorable event. Then came the long journey down to the beautifully scenic Dordogne where we were to stay in the CIS (International Residential Centre) in Salignac. We effectively had the centre to ourselves and once again it was ideally-suited to our needs: with separate chalets and a central refectory, it proved a relaxing and well-located start-point for our activities over the next few days. The staff were extremely accommodating throughout our stay and we certainly were not going to starve, with generous breakfasts, main meals and packed lunches. The morning was taken up with sightseeing in Sarlat, one of the prettiest towns in the region: in the afternoon we then had a tour of the internationally-renowned Bovetti chocolate factory, where everyone got to make their own chocolate Easter chick - as well as taking advantage of the highly-appealing shop! On to the nearby village of Villac, where FYC was to give an evening concert in the striking little church of St Vaast. A full rehearsal in the afternoon proved essential as Jo, Matthew and the choir battled to come to terms with a very tricky acoustic: time well-spent as it turned out, as the sound was spot-on during the performance given to a packed church. The concert of sacred and secular music included solo performances by Tabitha Chapman, Hannah Larkin, Charlotte Gill and Amélie Budd and the appreciative audience showed its pleasure with a standing ovation - followed almost immediately with a second after the obligatory encore. We were made very welcome during our short stay, including a drinks and nibbles reception in the sale des fêtes (village hall) after the concert. And we all got to meet Sophie’s mum! The final - and completely unexpected - icing on the cake came as the church elders insisted on giving us the retiring collection, which we graciously accepted. An early start as we had a 75-minute journey to Périgueux where the choir gave another short recital in the cathedral. Again the acoustic was astonishing, with the choir providing an especially magical moment in the climax of Maurice Duruflé’s motet, Tota Pulchra Es. As we arrived, the church was filled with the glorious sound of an improvisation by the incumbent organist Christian Mouyen. Impressed by the choir’s performance he invited FYC back to give a full concert and thanked us as we left in the best way possible with another improvisation especially for us. After lunch by the river at Les Eyzies, it was on to Sarlat again for a shared Concert Spirituel with the local Ensemble Vocale de Sarlat, which finished with a joint performance of César Franck’s Panis angelicus. Again the audience demanded more and FYC obliged with a repeat performance of Alexander Tilley’s In Flanders’ Fields, following an explanation of the words in French by our host choir’s conductor, Bernard Podevin. Another short reception and it was back to Salignac for supper, packing and bed. A long day’s travel back to Calais almost came unstuck with a long delay in getting round Paris, but we made the (almost empty) 8 o'clock ferry with less than five minutes to spare. It was only when in the ship’s cafeteria that we learned this was in fact the last sailing of the day - something which we were glad we hadn’t known earlier when sitting in a Paris traffic jam! Just another piece of the jigsaw falling perfectly into place. In what was her first tour as FYC musical director, Jo was full of admiration for what the young singers achieved throughout the week, both individually and collectively. So, all in all, a very happy tour, one which was successful both musically and socially and in which everyone worked hard and played hard to outstanding effect. Farnham Youth Choir returned to St Lawrence Church in Alton for this year’s Spring Concert on Saturday 11th March. They were welcomed by a full and most appreciative audience who enjoyed a varied programme showcasing the choir’s customary high standards. The first half comprised mainly sacred music, including a number of pieces familiar to the choir’s repertoire but introducing items from Pergolesi’s Stabat Mater and Tota Pulchra Es from Durufle’s Four Motets. Charming solos from Annia Grey and Jessica Miller featured, and the half ended with taste of what was to come with choir favourite Yo Le Canto. After the interval the audience was entertained by a largely secular programme, opening with the striking De Bello Gallico in which the choir showed their ability to add the emphasis of actions to the music and words. Another new piece to the repertoire was introduced, the lovely The Seal Lullaby by Eric Whitacre, and solos were impressively performed by Holly Giles and Isobel Cole. The concert closed with two of the more contemporary songs that have been introduced, Bob Dylan’s Make You Feel My Love, and finally Upside Down by Paloma Faith which featured lively choreography to close the evening on a high noted. The many new members who joined this year have integrated seamlessly with the choir under Musical Director Joanna Tomlinson, with the expert support of accompanist Matthew Rickard, and all are now looking forward to the forthcoming choir tour to France. Click here to see photographs of the Christmas Gala Concert. 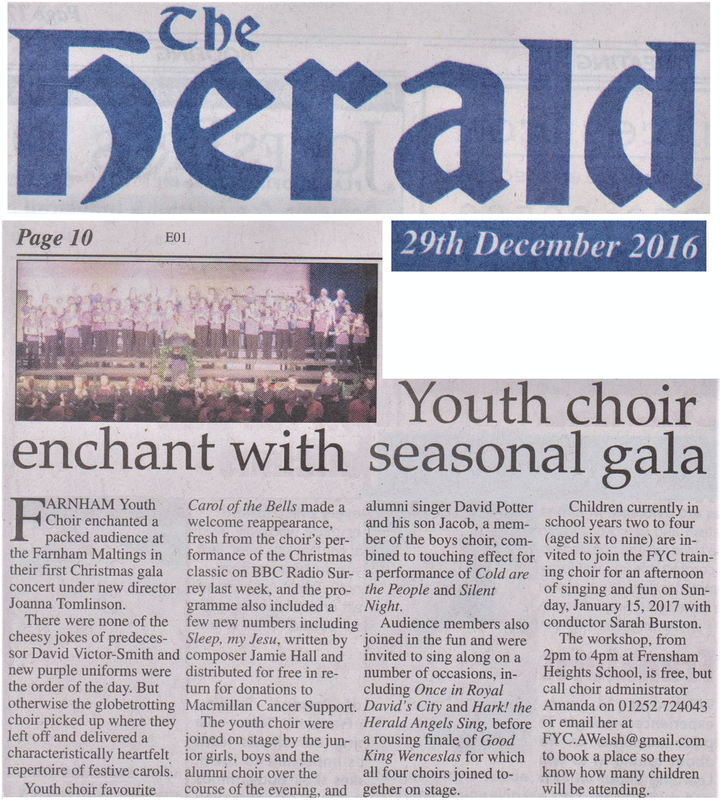 Farnham Youth Choir is a registered charity in England and Wales (1145358).